Adams heavy duty 85mm giant suction cups are very versatile with their mushroom head and 2 side pilot holes. The dual side pilot holes can be used for multiple twine, cable, cord or hook hangers. These suction cups have a multitude of hanging applications and with a space-saving "double-duty" configuration that is well-suited to window displays and point of sale installations. Adams giant suction cup fixes very securely to any clean dry, slick, shiny, smooth, non textured, non-porous surfaces like glass, mirrors, plastic, glazed ceramic tiles, car body work etc. and has a weight loading of 5.5kgs (12lbs). The Adams suction cup has a patented quick release tab on it's edge for quick re-positioning or removal which eliminates damage to the cup edge by finger nail picking. 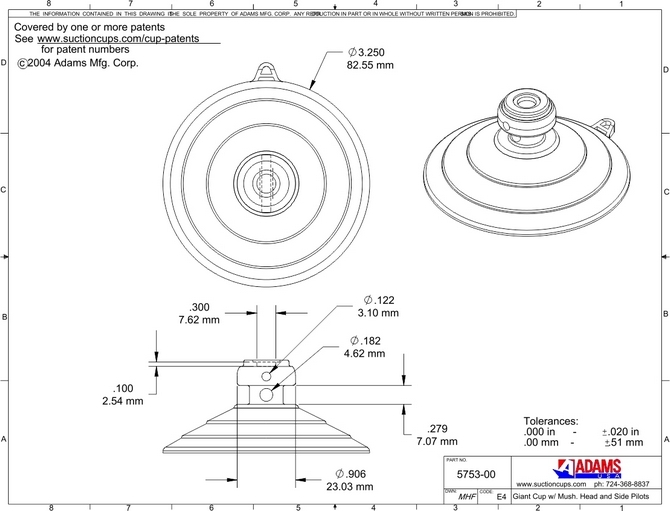 See technical drawing image for more details.